ListBox VBA Excel Example Macros Codes for Adding new Items,Moving all Items, selected Items from ListBox to another ListBox,clearing,Multi selection. 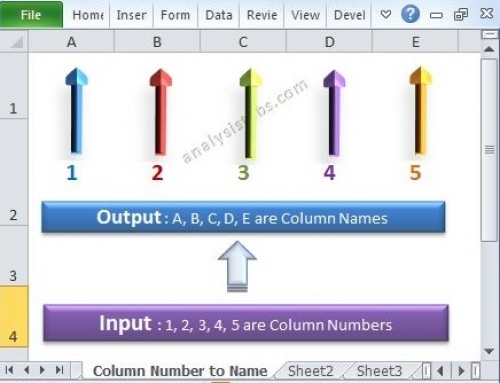 VBA ListBox in Excel is one of finest control in the Excel. You can show the list of items in the listbox and user can select any item and do different operations. 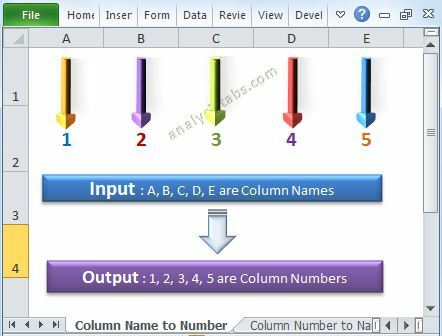 In this tutorial, we will explain different example on using ListBox in VBA Excel . 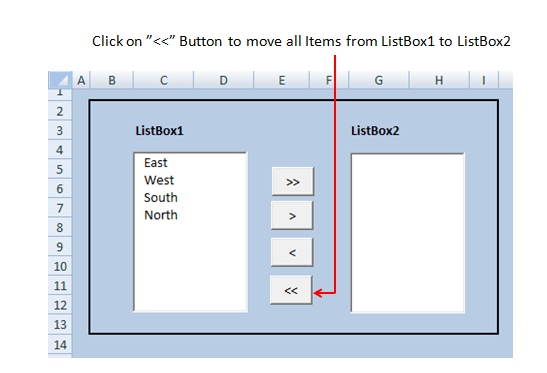 Select 3rd Button and Rename it as “cmdMoveSelLeft” and enter Caption as “<"
Select 4th Button and Rename it as “cmdMoveAllLeft” and enter Caption as “<<"
You can load the items in the ListBox while opening the Excel Workbook. The following example will show you how to populate the items while opening excel file. Here is the screen-shot of the ListBox with items. You can move the items from one ListBox to another ListBox. It is helpful while developing tools. You can give provide the users to select items and add into another ListBox. Here is the screen-shot to show you moving the items from one ListBox to another. 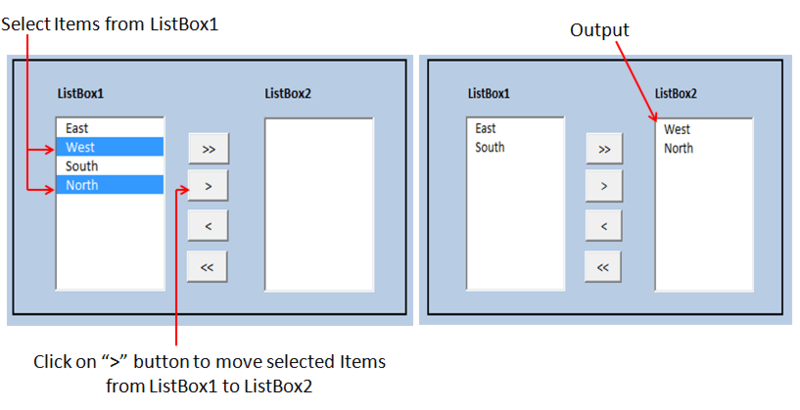 The following example will show you how to move all items in on-shot from one ListBox to another ListBox. You can clear the ListBox using Clear method. The following procedure will show how to clear the ListBox items, this procedure will clear ListBox items before loading an items to ListBox. The following example will show selecting multiple items. BackColor: To sets the back color of ListBox control. BorderStyle: To sets the border style of ListBox control. Height: To sets the height of the ListBox control. Left: To sets the left position of the ListBox control. 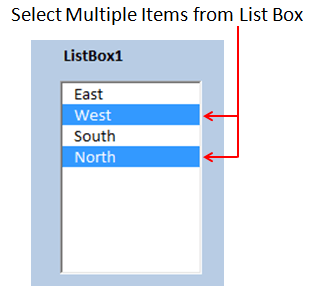 MultiSelect: To select single or multiple list Items of ListBox Control. TextAlign: To Align the ListBox list items. Top: To sets the top position of the ListBox Control. Width: To sets the width of the ListBox control. Thanks for your example, very well written. I was wodnering if you could simplify the code this way ? Thanks for your suggestions. Our focus is providing fundamental concepts on VBA with proper examples to explain the use in real-time (particularly for data analysis applications). Yes, we can simplify the codes even further, it will be easy for advanced programs. 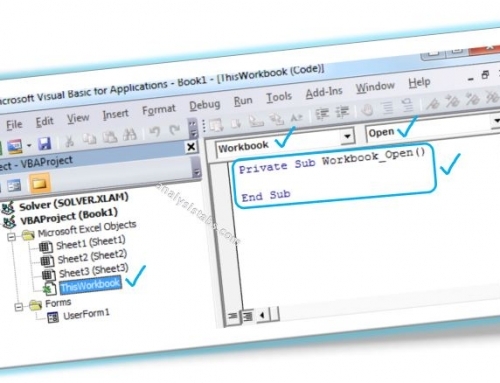 We will provide more simpler way of writing VBA Programs and best practices in near future. Is there a way to save the selection you make? It seems, if you make a selection and save the workbook it won’t save upon re-opening (e.g. if i choose “south” then save, then I re-open, “south isn’t in Listbox2). Excel will not save selected options in the listbox. 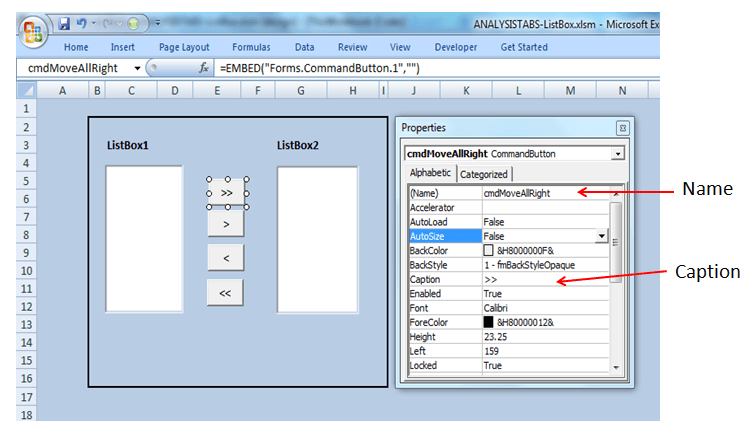 However, you can save selected items using VBA. this is very helpful for a starter like me..
Im just wondering on how to code if i want to fill the list box by values which is in another sheet in a column. this is for easy maintenance. Not hardcoding all the needed values. You can do this in two different ways. 1. 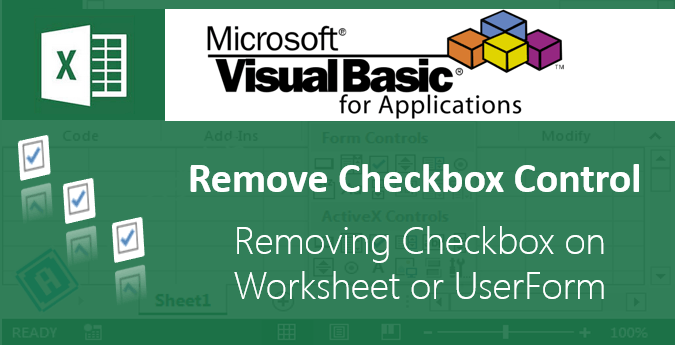 Without using VBA: Place a listbox form control (Not an activeX Control)in your worksheet. Then right click on it and choose the input range to fill the items in the listbox. 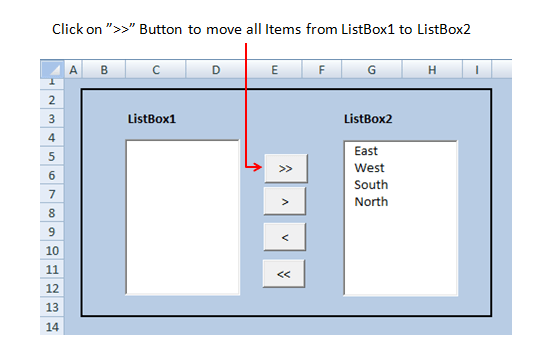 place a listbox (activex control) in your worksheet, let’s assue you have placed a listbox (ListBox1) in Sheet1. And you have the the data in Sheet2 for Range A1 to A10. The following procedure will populate the list box, you can call this in the workbook open event. Hi, This is very help like me as newbie. 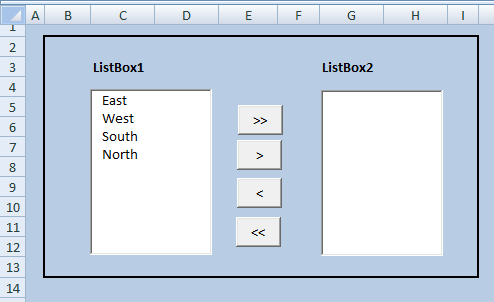 what if i have a userform with 3 textboxes which i want to fill the listbox using textboxes data. I followed excatly all of the steps as outlined – and although my items move between for the “all” buttons they do not move for the “select” buttons. Is there something else I can do for the “select” buttons? Thanks. I may have two problems with the code you’re providing. There, VBA’s always giving me an error. I’m using a range for my listbox values so they can be save. In fact, all the items in my list that are selected are being send to cells and when I reopen, I use ListFillRange to repopulate my ListBox. 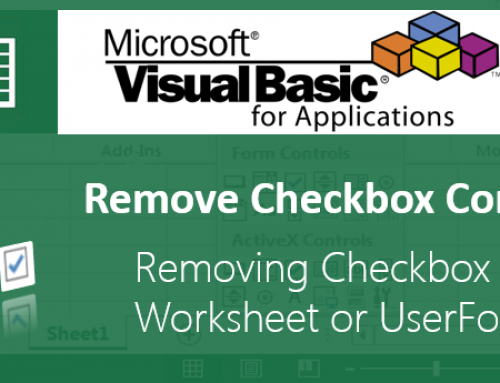 The problem is that I would like to modify my selection after reopening the file and VBA won’t allow it because the ListBox can’t be clear. It should work fine, could you please provide me the example file. Thanks for your code … really helpful in our project. I have one question… we are hardcoding the source values in Listbox1 similarly like your code. when we select the values to Listbox2 and again when you move back that value from listbox2 to listbox1 … that value is going to last row of Listbox1. Is there any way to get display in Listbox1 as we hardcoded in the source? I am new to VBA macro and also VBA code. I have an excel sheet containing following respective columns :-Region	Company, SicCode,	Address,	City, ZIP, ContactName, Telephone, etc…………. Here i have to perform some data cleaning work like to eliminate exceptions from company names ( -,”,’,, @, numbers, etc.,) , SicCode exceptions ( should only contain numbers, not alphabets and no special characters), zip code exceptions ( should be in 6 characters and one space between 3 characters like “A1B 2NO”, should not be like “A1B2NO”), Contact name should be in alphabets in proper no leading and trailing spaces, telephone should be in numberic and should not contain special characters (ex: “(123) 123 1234” ). for all these data clean, how can i write the code and execute. pls help me in session. 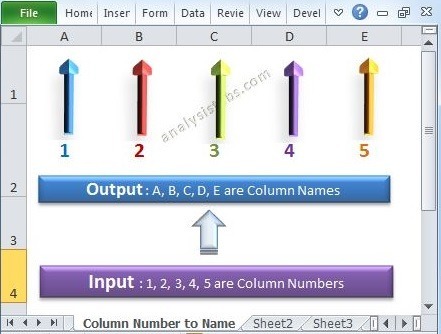 May i request you to kindly give codes and examples to change the range of listbox connected to a worksheet depending on the rows of data. i have a worksheet with 25 rows of data, which is a list of distributors. When the option to display the list is selected thru a command button to run the macro, If i added 10 more names, my listbox should display all 35 names. But, if i delete 10 names, from the original, it should display only 15 names. i.e, end range of listbox should be able to change to last row of data. To say, originally A1:A25, if 10 names added, A1:A35, if 5 names deleted then A1:A30 and so on. Advanced Filter With Userform . thank you Villa for this useful example. However, I noticed that there is something missing in subs called ‘cmdMoveSelLeft_Click()’ and ‘cmdMoveSelRight_Click()’. I mean, when you select the last item on the list (let’s it is listbox1, but the same happens with listbox2), then, while it is moved from listbox1 to listbox2, all the items are automatically removed from listbox1. This should solve the problem I described above. How to copy paste columns of the list items selected in listbox??? How to copy paste columns of the list items selected in list box in worksheet?? ?